My brain is often active, here are the products of some reflexions. When you have kids, it’s very probable that you spend time, a lots of time, around a sandbox. I spent a big part of last Wednesdays afternoon in one, trying to find some occupation myself. Z is pretty independent and wants to explore by herself, so most often, I get bored. This time, I decided not to be like other bored parents who pick up their phones and scroll. I picked up a bucket and a shovel and built my own story. At the end of the afternoon, the sandbox was filled with sand towers and Z found it quite impressive. Me too: the time passed by quickly. That’s a little bit like that I see life: it becomes exactly what you make it. You can sit on the side seing life through your phone or you can build your own story. Good luck! Alexander Pärleros is a swedish guy making a podcast with people who succeed in something. He wrote a book with the tips he heard of them and one is to not complain during 7 days. About nothing at all. I’m convinced that the mental position of your brain conditions how your life will become. Not because everything will be done by itself but because you will change your decisions by thinking differently. I think that this advice of stopping complaining is one good to deeply change your mental picture. Even if I’m tired, even if it’s raining, even if the automm is coming, I’ll do this challenge and report afterwards. Keep in touch! I’ve been living in Sweden for 13 years now. Meaning 15 years abroad. This is actually huge. When I arrived both in Germany 15 years ago and in Sweden 13 years ago, I had a perspective for the future just about some months ahead. And I was not worried. I actually had not much to loose if things were going wrong. I haven’t even had a thought by then how things could go wrong. Life was just a big cake to eat and I liked to try new pieces of it. Now, even if I like my life very much, I cannot say that I take every new day for an adventure. Well, we need stability for Z of course but I haven’t challenged my situation for ages it seems and with this came routines with a big R. I became lazy and unfortunately, automm is not for me a good period to start new projects. Somehow, I need to be true to myself and make some improvements to be able to say that I lived it all, every inch of my life was full lived, the day I’ll die. More fun, more creativity, more learning. The last book I read (listened to) was Hans Rosling biography about how he got to understand the world. He founded the organisation GapMinder with his daughter and son and this is worth to take a look in the tools-part of the website, even if you think your perception of the world i right. New facts come every day and I got astonished myself by the lack of actuality my knowledges about the world had. I remember so well this Sunday evening 20 years ago when the third goal was done during this football game and when France became champion of the whole world in soccer. Oh yeah, for me, 16 years old at this time, it was the beginning of the dawn of my adult life. I did no know anything about football but had a big crush in a guy who loved it, so I did learn some of the rules and the name of the football players. And it went well! The team took itself to final! I got a tee shirt from the team after a bet with my mother, a tee shirt without star yet. And the third goal came and I got a kiss from my crush. Best goal ever at this moment. The little town I was living close to went totally crazy, champagne from the balcony, Gloria singing “I will survive” everywhere and tons of happy people. It was really something to experience. A moment of pure peace and joy for the most of is in France at this time. And this year, 20 years after, when the football WM began, I knew it would be a victory for France as well. I did not tell anyone because Sweden was also playing and I was in minority but it became more obvious with the games. Somehow. And I can tell that I’m not a football fan at all, I just felt it in my stomach. I bought a tee shirt for my daughter when I made a quick visit in France and I took my no-star tee shirt off the cupboard and we began to watch every game with France playing. Z needed the pool game to understand the point, but when we arrived to the final, she got it with the special shirt, the flag and the songs. And we did win. We= the Bleu blanc rouge in the field and in the hearts. It was wonderful to see my 1,5years old running with the flag at the end of the game. Somehow, she is at the dawn of her life like I was 20 years ago at the dawn of my adult life. 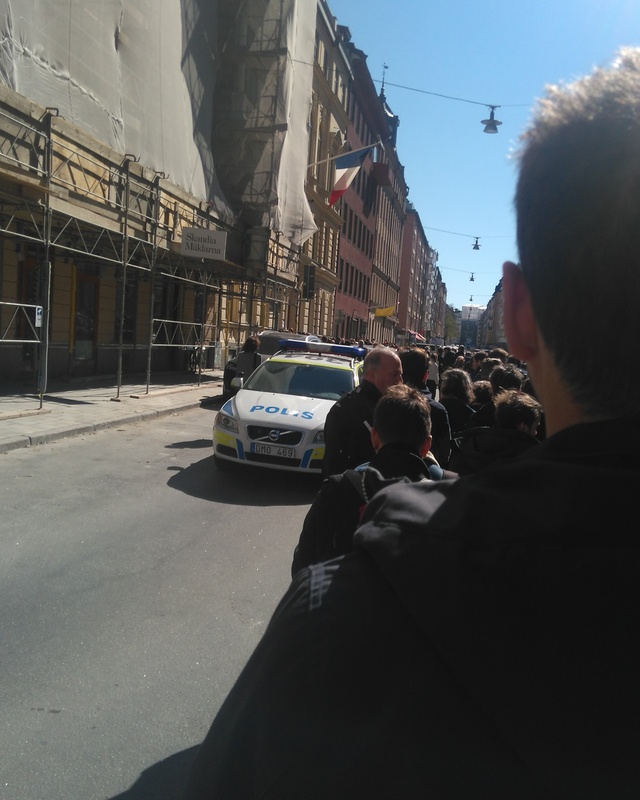 I was in Stockholm this Sunday morning to vote. This is the second round of the presidential elections in France and more than me in Sweden thought that it was important. Two weeks ago, it tool about 15 minutes but this time, it took me an hour to queue. With the travel back and forth, it will be a five hours history. It does not matter, it could have taken the whole day, I would have staid to make my duty. Democracy is too important to me to miss it. This is also funny this feeling to feel myself in France every time I go to the ambassy. This is after all just another building in Stockholm but the mood and air are French there. Friday at home. Z turned 10 weeks this morning. It feels like she has been with us for ever. I’ve now been at home from work 14 weeks. The first 4 weeks, I was waiting for Z to show up and then 10 next weeks, it has been a discovery of this little girl plus for me the start of coming back in my normal shape. Without going in too much details, the birth went pretty well for me, but after 9 months of carrying a stomach which is getting bigger and bigger, my stomach and back have a long way to be in shape again. I’ve started some exercises but honestly, it is for me difficult to take 20 minutes per day and do them. I just hate it. I’ve been taking pretty many walks, mostly to make things than just with the goal to go. I hate to walk without a purpose. I still have my goal: to run 10 km in 50 minutes when Z will be 1 year old. The other day, I took a long walk (more than 10 km) and put some running in it (run one minute and walk 4 minutes). I was pusching the strolley as well, so it was very challenging. It was the very first time I was running, and it felt like my legs were very weaks. I did not pee on myself, which is one of my biggest fears for the future after the birth. But… Today, two days after my long walk, I feel in my back that I have difficulties to hold myself straigth. I really need to make these exercices for the back and stomach, but well… Where is my motivation? I’ve also been swimming and it went pretty well, except for my breath. I need to train up my heart again, but it will be ok.
Another thing that will change soon: I will go back to work 5 months earlier than planned. And I (and the whole family) are happy with that. I am incredibly thankful that M’s and my employers give us the possibility to do so. M and I will work 50% each every week. This will give us the opportunity to spend as much time with Z during her whole time before she begins the preschool. Of course, this is only possible because I don’t breastfeed her anymore (I stopped when she was 2 weeks) and because I feel strong enough in my body to work 2 to 3 days a week. This is not given to everyone. To me, this is the real face of parity. M and I will have as much insight in Z’s development. Right now, this is heartbreaking when something new happens during the day and M misses it. I also think that we will even more enjoy “adults discussions”and passionate work during our working days and free time when we are at home with Z. Everyone is different, but for me, a whole week at home with Z when M is working is a bit too long. On thursday, I feel restless and Z still needs her quiet, sleep and so on. To be at home with your baby is incredibly possible in Sweden, compared to other parts of the world. I have France as comparison and I can tell that I am very happy to be a mum in Sweden for that. I do think though that it exists a lots of fake informations going on the internet (not only in the world of Dj Trump.et…). For a kid in Sweden, you have 480 days to share between the two parents, with 90 days that are fixed for each parent. The parent who doesn’t give birth gets 10 days when the baby is born. Most of the time, the mum stays at home the first period and then the other parent is at home. From all the people I know, I don’t know one family which shared the parental leave so early as we do. It may for sure have to do with the baby needing the mum for the breastfeeding. OR if it is not the reason, I hope we did not miss anything. Because it is a jungle… You have your 480 days to share between the two parents, the preschools maybe do not have place for your kid when you want, there is a lots of vacations from school you have to think of and as we, you may not have an easy babysitter closed to you, that you can call quickly. You even have to think of your retirement money, of the sickness money and in general, how much money you are willing to get to make your budget go round. And this is one missunderstanding that travels on the internet: you are NOT getting 80% of your whole salary when you are at home with your kid. Well, yes, you are getting if IF 1) you are taking 7 days of parental money a week 2) your salary is under the roof the social security pays 3) you only get it for 300 days of the 480, for the 180 days left, you get 18 euros a day. I don’t know anyone making the 3 things working together. Of course, most of people get kids because they want it, so did we. We knew these consequences and the happiness to have Z in our life is bigger than that, and we have good financial conditions since a while, so no arm on us. But think of that when you are believing all what is on FB. Our little girl is growing. She got the priviledge to meet her grand parents from my side. This was funny to see how she was surprised that our visitors still was here on day 2 (they were the firsts to sleep over at our home since she was born) and how she reacted with them. My arms was the place she wanted to be when it was too unusual and at the end of the week, she did not smile to M anymore when he came back from work. These two things made me think a lot. I don’t want to be the only person she finds safety with. I want her to find her dad as safe as me. She is now much more expressive than she was before. We get smiles pretty often when she is awake and she now knows how to “talk” to us. She understood that we react pretty fast when she cries so she cries when she wants something else than she already has. She doesn’t want to lay down anymore when she is awake. No, she wants to sit. the only problem is that she is not strong enough to sit by herself, so we need to “sit with her”. She still can be in her baby-gym pretty long alone (we are around of course) and find it interesting. Another pretty good thing too is the nights. She is very nice. I don’t want to talk too early and “break the magic” but I’ll tell you later. In other words: we are very lucky. Yesterday, on womens day, I thought a lot of how it will be for her later. How will it be for her to grow in this world as a girl and later woman? The days follow each others but don’t look alike. (or how it is said in english…). today is sunday anyway and we got a good night (at least I did, M got a good sleeping morning). It is really sunny and we took a walk outside. I made it longer with a so called “power walk” and I was so willing to run! But I didn’t and sticked to a quick walk. It is only five weeks ago my body gave birth to Z and even it the leaking went well so far, I don’t want to be überambitious. To illustrate this post, I’ll put a picture of hands. Because a lots of things we do begin with an action of our hands. What will these little hands do later? Good things I hope! There is nothing much to tell these days. We are at home, M working and me resting. 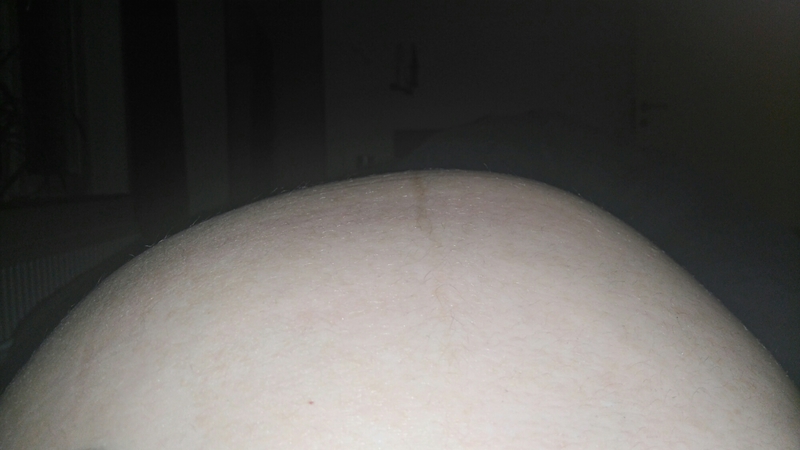 14 days after due date, still no baby with us. The whole thing seems so unreal. It snowed the other day and the temperatures are below -10 for now, with variations down during the night. I actually don’t care since I don’t go outside at all. I don’t move, I don’t want to meet anyone but M, I sleep on the couch some hours every day, in front of the TV with shity programs shouting in the background. And I really don’t care! I am so far of the political correctness which would dict me to make something “useful” of all this time. But you know what: I couldn’t care less.